Reads magnetic stripes. Versatile, low cost. The MiniMag magnetic card reader can read up to three tracks of information with a single swipe in either direction. Its standards-length slot makes it easy to use. Both beeper and LED indicators signal a successful read. The MiniMag Intelligent Credit Card Reader delivers exceptional functionality and value in the smallest possible package. It can be used as a free-standing unit, or permanently mounted with threaded inserts on the bottom of the reader. TTL, RS-232, and keyboard wedge interfaces are available. Fits in tight places. Edits and formats data. The MiniMag Intelligent Credit Card Reader is designed for POS and desktop applications where space is at a premium. The entire unit is just 90mm long (about the length of a credit card), giving it the smallest footprint of any unit with comparable features. 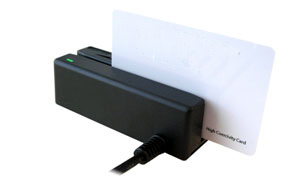 The MiniMag magnetic card reader is a fully intelligent slot reader that can be programmed to divide, rearrange, edit, and validate fields of entered data. or call (541) 601-8282 for more info on the MiniMag Credit Card Reader.